In this case I'll be using this one, downloaded at the 1k size. Once you find a sky you like, save out the file to a memorable location and open up Lys. 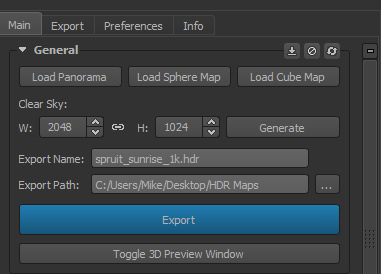 Your cube map or panorama can be loaded in with Main > General. Once loaded, the 3D preview window will pop up. After verifying that the map came in correctly, this can be safely closed. Make sure you also set your output folder under Main > Export Path. The Irradiance map is already processed for what we need. Next, we need to enable Specular and tweak the settings a bit so our reflection map will have the specially processed mip-mapping we need. 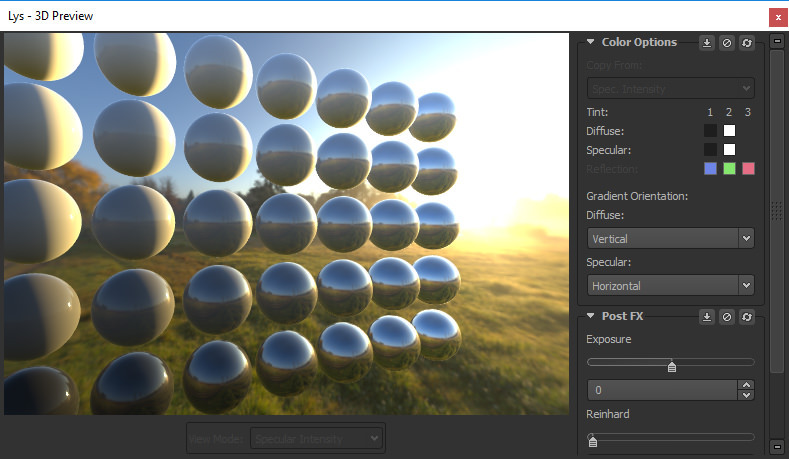 Check the box next to Main > Specular, then set the roughness value to the minimum value of 0.0014 and MIP Offset to 0. If you like, you can preview your mipmaps to see how the blurring will look. Next there are some settings we need to tweak on the Export tab. Set the global export type to DDS and the bitdepth to 32_32_32_32F. 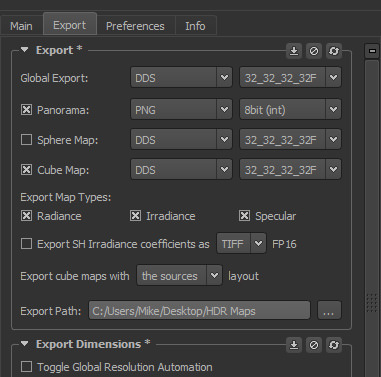 Check the boxes for Panorama and Cube map, and set the panorama to PNG and 8 bit. The PNG is used as a reference when browsing files. Uncheck Sphere Map. For export map types, check Radiance (which we can use as a background), Irradiance (the ambient lighting), and Specular (the reflection). 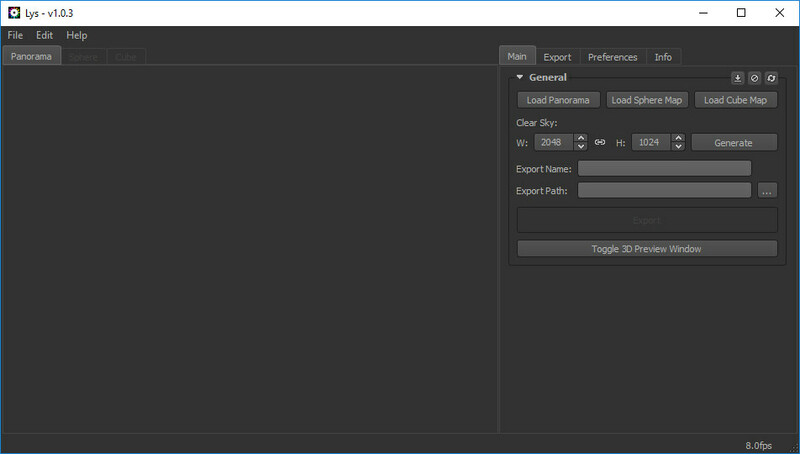 If you run into any issues when loading the DDS file into Inspector, go to the preference tab and enable the "Use Legacy DDS Header Encoding" option. Support for current DDS headers is expected to be added shortly after release. 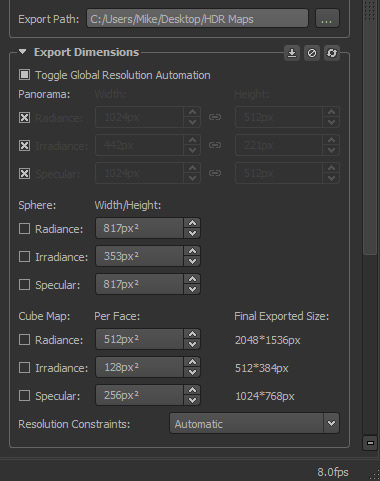 You'll also want to set up the export dimensions. First, disable "Toggle Global Resolution Automation". 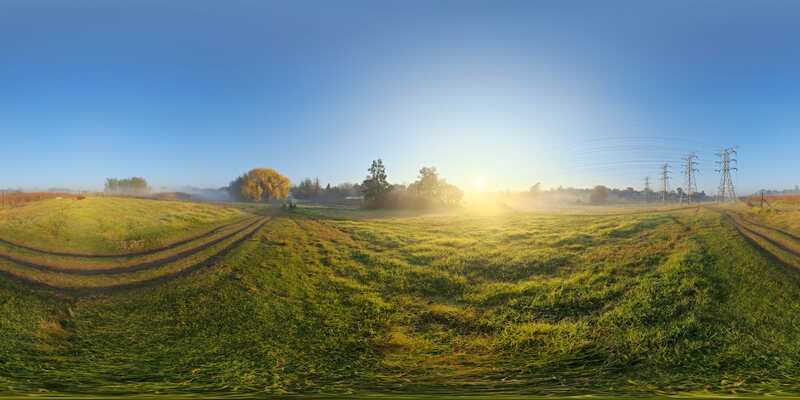 Check the boxes in the Panorama section to turn those back to automatic. Next, under Cube Map set Radiance to 512^2, Irradiance to 128^2, and Specular to 256^2. Leave the boxes unchecked. Once your settings are all in place, return to the main tab and press export. You can save your settings by going to Edit > Save Settings > To File. 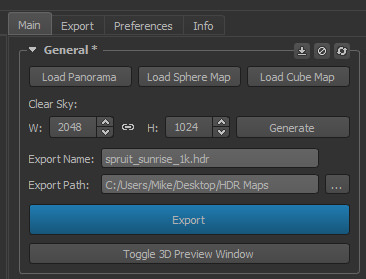 If export is not enabled, your maps are still processing. Lys will process for a bit, then your maps will appear in your export folder. 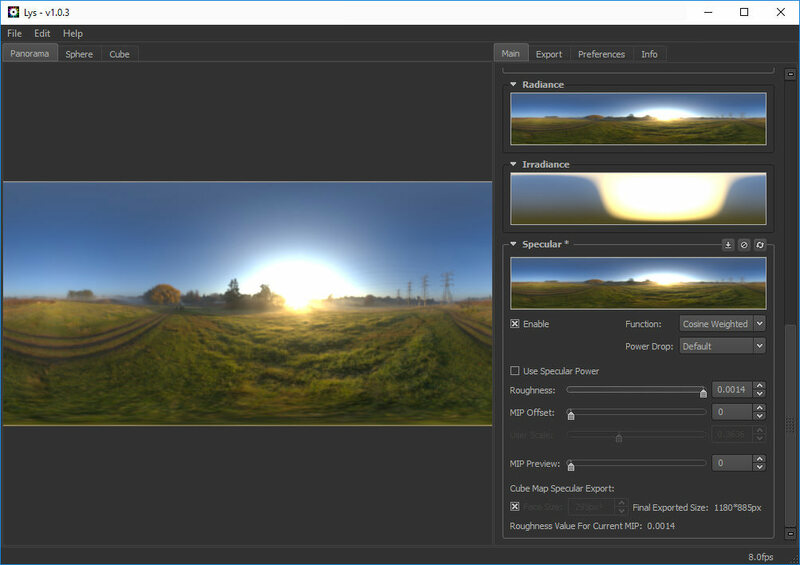 Now that your HDRI has been processed, they are ready to be added to the Diffuse (Irradiance) and Specular slots within the scene settings in Inspector. If you are rendering from a photo based HDRI, you may also want to add a Background node so the Radiance map can be included as a background. Once added in to your scene, you're ready to view your image based lighting on a PBR-ready model such as a GLTF export.